^ 1.0 1.1 "Pan-Scandinavianism". (2007). In Encyclopædia Britannica. Retrieved April 29, 2007, from Encyclopædia Britannica Online. 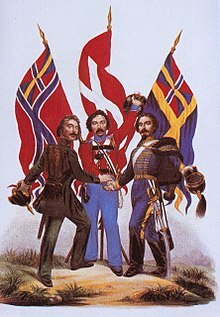 ^ The political movement of Nordism should not be confused with the racial ideology of Nordicism, which latter considers the Nordic people a master race. ^ The Literary Scandinavism 互联网档案馆的存檔，存档日期2007-06-23.. Øresundstid, 2003. Retrieved 6 May 2007. ^ 4.0 4.1 4.2 Ola Tunander (1999). "Nordic cooperation", UDA085ENG. In Nytt fra Norge, ODIN - Information from the government and the ministries, Ministry of Foreign Affairs, Norway. See also Tunander, Ola (1999). "Norway, Sweden and Nordic cooperation". In The European North - Hard, soft and civic security. Eds. Lassi Heininen and Gunnar Lassinantti. The Olof Palme International Center/Arctic Centre, University of Lapland, 1999. pp. 39–48. ISBN 951-634-690-1. ^ 5.0 5.1 The Students 互联网档案馆的存檔，存档日期2007-08-13.. Øresundstid, 2003. Retrieved 6 May 2007. ^ Wæver, Ole (1992). "Nordic Nostalgia: Northern Europe after the Cold War". International Affairs (Royal Institute of International Affairs 1944-), Vol. 68, No. 1 (Jan., 1992), pp. 77-102.